Offering Professional installation for all types of Wood Flooring & Laminates. we also offer Custom design, Borders, Medallions & Inlays in a Custom Installation. We also do Installation of Stair Treads in most cases if needed and refinish old stair treads. We offer a full line of wood shoemoulding, thresholds of various types and wood quarter round in various species. We also do wood floor repair, patching and weaving new flooring into existing flooring. 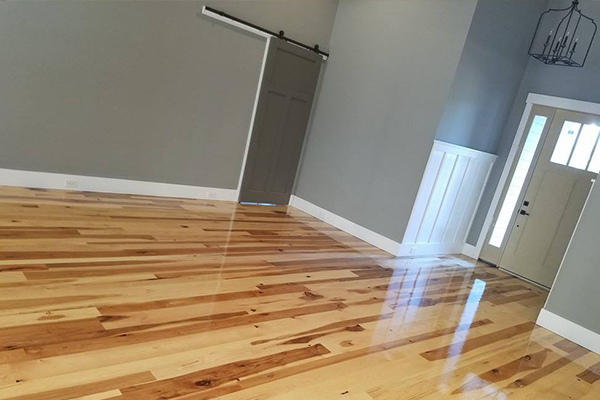 Professional finishes include oil-based Polyurethane, water-based urethane, and commercial grade finishes, along with professional stains specifically designed for wood floors. 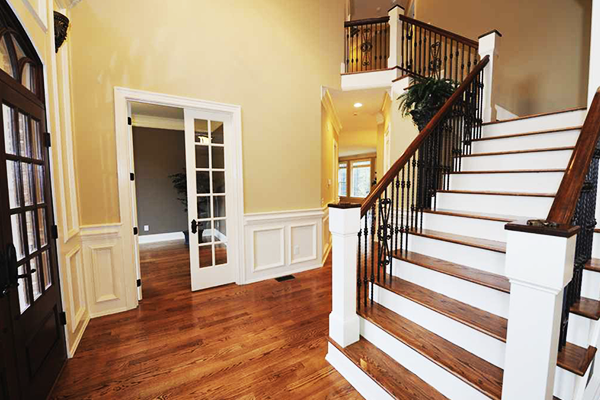 Finishes protect your floors from years of wear and tear. All finishes are available in various sheens from a Matte, Satin, Semi-Gloss or a high Gloss sheen. 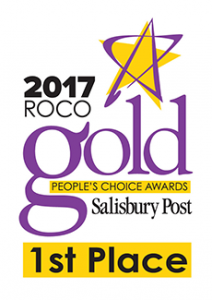 Popular brands we prefer include from Basic Coatings Emulsion™, StreetShoe® water base finishes, then Longkote Polyurethane, and DuraSeal® stains. When choosing a finish, keep in mind durability, We also offer the 0 VOC Environmentally friendly Rubio Monocoat. An excellent 1 coat floor finish made of organic materials that is very durable. A recoat is offered when your floor is not worn badly, but it does need a fresh maintenance coat. We recommend a recoating every four to five years or 10 to 12 years, depending on the traffic on the floor. The process for a recoat involves a product called Bona Prep™. The “prep” is applied then the floors are buffed with an abrasive pad and allowed to dry. Then the floors are buffed with a screen or abrasive pad. After that, the floor is vacuumed and we run a tack cloth on it. Your selected coat is applied and allowed to dry. 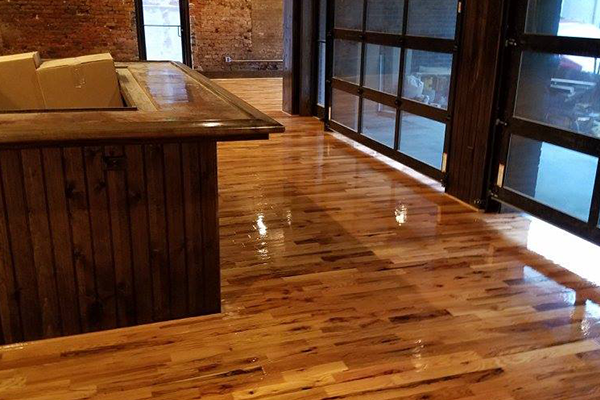 We have Sanded & Refinished hundreds of Hardwood Floors that are old and worn, have been damaged or for people who just wanted to change the appearance or color. We can Sand/Refinish wood floors that are a few years old or a hundred years old.Have great experience working with old antique flooring also. To have a total resand is not always needed. It depends on the care of the floor, the amount of traffic, the amount of wear and other variables. But in many cases if the floor has been maintained properly and not allowed to wear through to the wood, a recoat (Or what some call a “Maintenance coat”)can be done in place of a total resand. For a fraction of the cost of a total resand. We have had extensive experience in completing various types of hardwood floor repairs. Each is unique to it’s own situation. But whether it’s water damage, fire damage, termites etc there is an option that will work for you. Give me a call so we can set up a time to look at your repair need and see which option suits your situation best. We will offer as many options as can that will suit your budget. We offer “Dustless” sanding for reduced dust as much as 60% at our standard price. We also offer “Dust Containment System” (DCS) for up to 90% dust reduction. The larger Dust Containment System is offer at an extra cost.